Dr. David Miller, MD Chief of Maternal Fetal Medicine, Children's Hospital Los Angeles, explains the risks associated with obesity or being overweight during pregnancy, which include need for c-section, gestational diabetes, and oversize fetus. 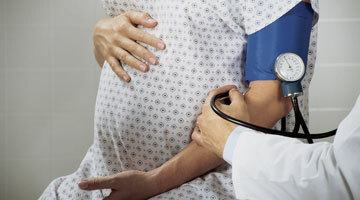 What are some of the risks that come along with overweight or obesity during pregnancy? There are maternal risks. Clearly mothers who are obese or overweight during pregnancy have higher likelihoods of different conditions like diabetes and like higher blood pressure, and obesity carries a slightly higher risk of Caesarean Section. There are fetal risks as well. Diabetes and hypertension by themselves can potentially endanger the fetus, and diabetes and obesity can result in excessive growth of the fetus. Excessive growth of a fetus can jeopardize the safety of the fetus during delivery because sometimes a baby is so big that the birth process can be difficult and the baby can be injured during birth. The condition is called Shoulder Dystocia, and basically it is a condition where the baby is so large, the shoulders are so large that the head can deliver, but the shoulders cannot, and sometimes it's difficult to deliver the rest of the baby, potentially causing injury to the nerves of the neck and the arms.